Reflecting on my semester abroad in Poland. Things have been very quiet on this little corner of the internet for quite some time, but finally I have the chance to sit down and explain why. As you may have figured from the title, I have spent the past four months studying abroad in Poland as an Erasmus student, at the Academy of Fine Arts in Warsaw. A year before applying to study in Warsaw I attended a presentation about Erasmus at my home university. I knew from that day that it would be something I would aim to do in my second year. Choosing an institution involved copious email conversations and research, as my home university didn't put the academy forward as an option for photography students such as myself. However I really loved the sound of the academy once I noticed it on the general list of my universities' partners, so decided to ask some questions to see if I could do an Erasmus semester there. My conditions for picking an Erasmus university was firstly that I wanted to be in a city, because at home I study in a small town and always miss being in a city. I also wanted to find a programme that was more varied then my specialised course back home, that would allow me to take graphic design classes alongside photography. However the main reason I wanted to study in Poland is that my grandad was Polish and I have been wanting to find an opportunity to spend more time in his country and learn more about his culture. Once I got accepted to study at the academy there was a lot of paperwork and organisation to work through which is definitely the downside of doing an Erasmus exchange. I also had to take a plane on my own for the first time after a travelling by coach all night from Sheffield to Heathrow. Which I didn't get any sleep on whatsoever. Travelling alone to begin with was probably one of the hardest parts of moving away to study, because I was so anxious about moving to a new country where I didn't speak the language, so doing it by myself made it feel even more daunting. I booked my accommodation for Erasmus through AirBnb because it meant I wouldn't have to worry about contracts and sorting out bills, and I also knew from experience that I would get a good discount for booking somewhere for such a long period of time. Through AirBnb I booked a room in a family's apartment, which I really recommend doing if you are moving to a big city in a foreign country alone, because being with a family will make you feel less isolated and living with locals who speak the language will help you in so many ways. I have to admit I am from a small family and the youngest of two siblings, so I wasn't quite prepared to live with young children and have so many different relatives visiting the house. But it actually was really lovely and allowed me to appreciate a different kind of home environment. I also got to experience a traditional Polish easter celebration which was very special for me. One of the hardest things in my first month or so was actually the weather in Warsaw. I knew that Poland would be cold for the first month at least but it got to -15 one weekend and I am someone who has barely experienced below zero before. That and feeling isolated in my studios as the only Erasmus student also really took its toll on me to begin with. There was around twenty five to thirty Erasmus students at the academy but unfortunately I was the only photography student and would often feel left out and lost in my studios. As some of my teachers weren't comfortable with their English and in one of my studios for example the assistant would translate for the professor and the technician would just talk at me in Polish. Which took some getting used to. So that brings me onto the Polish language, which I have to admit I made an appalling attempt at learning before arriving in Poland, and I really felt I didn't have enough resources at home to really make a good go of it beforehand. I found that when I arrived most words I had learnt either weren't useful or I couldn't pronounce them correctly, and actually what you think you should learn as basics and what you will actually need to use are two very different things. I wasn't planning on taking the optional Polish class for Erasmus students to begin with, but after moving in with the family of which the mother didn't really speak any English. I felt that to live there for four months I really had to learn how to say a lot more. However my first experience of these Polish classes was horrendous. In my experience, which to be fair isn't huge in learning foreign languages, I have never been taught only in the foreign language I am learning. Which is what happened and I wasn't expecting at all, and to begin with I found very frustrating and got quite upset because I felt so lost as soon as we started. One of the reasons I felt so lost in these classes at the start was because many of my fellow Erasmus students were from Slavic countries such as Slovakia and the Czech Republic, and this made learning Polish for them a lot easier because their languages are similar to Polish. However I wasn't massively aware of this to begin with and it seemed as though everyone was understanding everything except for me and a fraction of the others in the class. Looking back however after finishing my four months I am really proud that I didn't quit that class and worked really hard on my language. Which I think has really paid off, and as someone who has always written off being able to learn a foreign language I am very glad to say that I am continuing to learn Polish and hopefully when I go back I will be able to have full conversations with people. The Academy of Fine Arts in Warsaw itself is a very different university to my home institution. Professors there mostly spend half of their time working as professionals in their creative fields alongside teaching and are often at the top of their creative industries in Poland. I found this very special and was happy for them to be giving me one on one teaching a lot of the time, however I did feel in a more negative sense that the academy overly treats its professors like stars, allowing them to operate however they wish. All of my studios were so unique and mostly really interesting, however professors would seem to arrive whenever they wanted to, and often I would be waiting an hour or so for a professor to arrive even if their studio was supposed to start at 9:30 for example. I actually only had one professor who would start her classes before 10:30. One thing I did really like about the academy is that there is an emphasis on experimenting with and exhibiting your work. Every single studio was working towards different exhibitions that I was able to be a part of, and in my Imaging for Media studio for example we had real graphic design briefs from companies. I also really loved having classes in the main buildings of the academy, which are beautiful and located in the heart of the city near the old town. Being surrounded by so much history and grandeur was just so special. Studying at the academy was of course a huge part of my Erasmus experience, however for me what I will treasure most are the friends I have made and all the places I have visited both in and out of Warsaw during my stay. Exploring a new country and meeting people from different countries with various backgrounds was one of the most rewarding parts of the whole experience because it really broadened my horizons and knowledge of different cultures. My Slovak friends for example taught me so much about their country and also their creative disciplines, such as stage design and painting restoration. 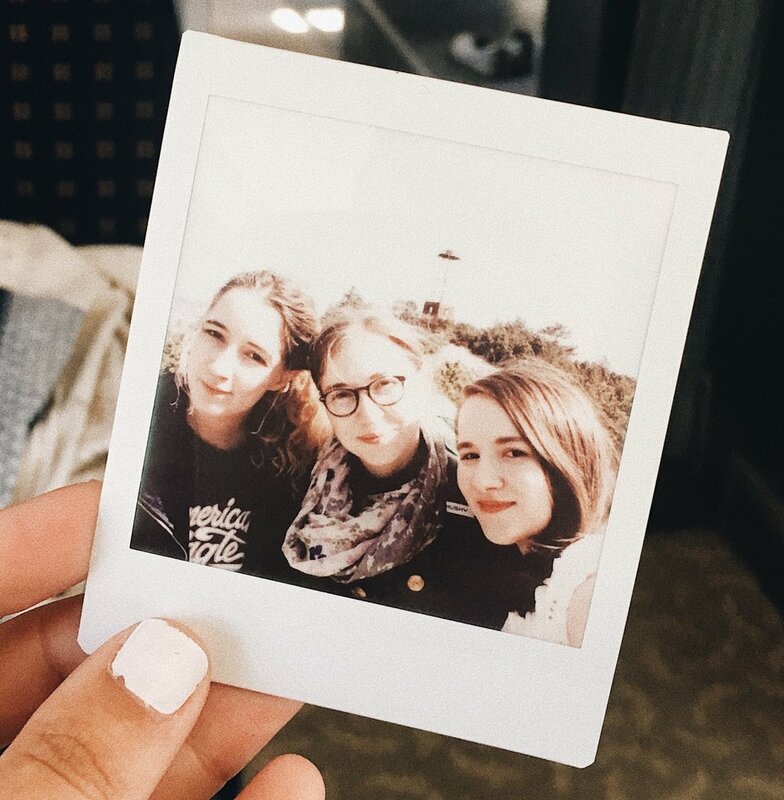 Travelling to places such as Gdansk and Hel with my friends were also such an amazing experiences and I have so many memories I will treasure with them. Before I get too soppy and longwinded about my experience I feel I should discuss briefly whether I recommend Warsaw itself and why. Clearly I am a fan, and even though the winters are too cold for my liking, spring and summer in Warsaw is beautiful and something I recommend experiencing if you can, because it really is such a varied city. There are beaches along the river, skyscrapers, an old town and so many parks and sites of historical significance. So much so that you can easily go without even leaving Warsaw during your studies if you don't want to. Public transport in Warsaw is easily the best I have ever experienced, there are trams which go almost everywhere, a modern metro system and lots of buses, and because you buy your ticket at machines before you get on the bus you never have to talk to a driver. So everything moves a very quickly. As an arts student Warsaw is a super creative and inspiring place to be in with so many galleries, cultural venues and events happening all the time. One of my personal favourite things is how good the coffee shop culture is. Sometimes I would spend hours in coffee shops such as Green Cafe Nero (infinitely better then the British version) working on projects. Another thing that really typifies cities this part of Europe that were affected by communism is the abundance of apartment buildings over houses, which seem almost non existent. Personally I really like living in an apartment in the middle of a city and that is one of the reasons I would love to live in Warsaw in the future, because I really like that kind of living situation. Finally I would like to add that Warsaw and Poland itself are very cheap, including transport, and as a student you get 50% off all travel including most trains, and being in the centre of Europe it is so quick and easy to travel to surrounding countries. As for whether I recommend studying abroad or not, yes is my answer of course. At first it will be overwhelming and at times very isolating, however experiencing a different culture will help you grow as a person. My confidence has increased in so many ways in the past few months, and meeting new people and living in a completely new environment will really broaden your perspectives. So that is my novel of a reflective Erasmus post! There is so much more I could talk about and I will have some travel posts going up in the next week about Warsaw and some other places in Poland I have visited, so do look out for those if you want to see some more photographs and places to visit! 8 places to visit in Warsaw, Poland.